Aster flowers are often commonly called the ‘michaelmas daisy’, they include a wide range of flowering plants such as Aster novi-belgii and Aster callistephus chinensis. 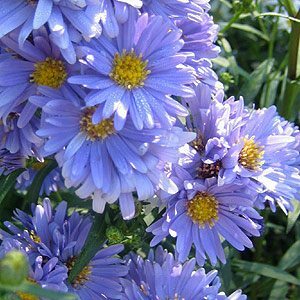 Aster novi belgii ‘Blue Gown’, pictured right is one of the many varieties available for sale online. With some grown as perennials, some as annuals and some as biennials they are a part of a large group of mainly frost resistant plants with daisy like flowers. Widely used in cottage gardens, mass border plantings and often grown in containers, Aster are a fairly upright plant with the main attraction being the flowers. The real beauty of these easy care plants is the free flowering nature, masses of flowers from summer right through until autumn. A good variety of flower colours from white through to pinks and reds as well as purple and blue. Asters have long been popular as border plant or in the rock garden with large clusters of daisy-like flowers from white, purple and lavender through to pink and red asters are a hardy plant. A well drained moist soil in a sunny position is best, although asters will handle part shade. Deadhead asters for repeat flowering. Varieties such as Aster ‘Ruby Buttons’ (pictures right) are so good that hay are also grown for the cut flower industry. Tall stems and attractive glossy leave s, the stems are topped with double flowers, a very attractive ‘ruby red’. This is a tall growing plant to nearly 1m, over time it will grow to form a good clump up to 50 cm across. A.frikartii ‘The Monch’ and ”Lady in Black are both popular cultivars. Aster ‘Violetta’ with its rich deep purple flowers and golden yellow centres is a stunning plant for late summer flowers, bees love it. Aster laevis ‘Calliope’ – Excellent mauve to pale blue flowers.